Brine shrimp ( Artemia spp.) is probably one of the most common planktonic foods offered to marine animals. There are a variety of reasons for this, but two of the most significant are probably history and ease of availability. Virtually everyone is already familiar with brine shrimp, and it is a rare petshop that does not offer packets of frozen brine for sale. That does not, however, mean that it is one of the most nutritious foods available on the market to feed your saltwater tank inhabitants. Like the grocery bag analogy listed above, brine shrimp themselves are often not the most nutritious of food sources for marine fishes and invertebrates. However, it is a little more complicated than the rotifer example I just discussed. The nutritional value of adult and baby brine shrimp can be very different, and even if we consider only newly hatched baby brine shrimp, it is not possible to make any sweeping generalizations about the nutritional value to your tank. The reasonthat nutritional value varies so much is because it depends on a number of factors, including the age, the source, and the quality of the brine shrimp “eggs” from which baby brine are hatched how nutritious the newly hatched brine shrimp will be. How much difference does the source and quality of your brine shrimp “eggs” make? Well, there are great differences in the nutritional value of different batches of baby brine shrimp hatched from different sources, and the dealers separate the stock according to the quality into at least 4 or more categories: premium, high- and low quality aquaculture grade, and then hobbyist grade (in that order). As suggested by this list, the brine shrimp available to us in the hobby is not exactly the best quality stuff out there. Even among the aquaculture grade cysts there are enormous differences in the nutritional profile of the baby brine hatched from different locations. For example, a number of studies have shown that growth and survival of fish larvae (including milkfish, striped & hybrid bass, and cod among others) fed unenriched premium baby brine shrimp (bbs) from San Francisco Bay was the same as those fed enriched premium bbs from the Great Salt Lake in Utah (e.g., Webster and Lovell 1990; Han et al. 2000; Lin and Zhang 2001). In addition to these growth experiments, direct comparison of the nutritional profile of these different bbs suggests that unenriched newly hatched bbs from San Francisco Bay (SFB) were approximately equivalent to HUFA enriched (in a variety of ways) bbs from Utah in terms of growth and survivorship (there were no statistic differences among the treatments). However, both unenriched premium brine from SFB and enriched premium brine from Utah vastly outperformed (showed significantly higher growth and/or survivorship than) unenriched Utah brine shrimp (reviewed by Sorgeloos et al. 2001). And even the best ofenriched brine shrimp do not perform nearly as well as copepods (covered below) when it comes to the nutritional value for raising marine fish in captivity (e.g., Coutteau and Mourente 1997; McEvoy et al. 1998; Shields et al. 1999). Again, I emphasize that these comparisons are made with the aquaculture grade brine shrimp that never even make it into the hobby: don’t expect to go to your local petshop and be able to ask for premium brine shrimp ‘eggs’ from SFB! But don’t let the location of collection fool you into thinking that all brine shrimp ‘eggs’ from SFB will be fantastic: there is actually far higher variability among SFB cysts (from premium aquaculture down to hobby-grade) than there is among the Utah cysts. Also, brine shrimp are not just being sold from the U.S. anymore: there are also numerous other sources of brine shrimp including China, Russia, South America and Canada as well. As with all the other sources that we have discussed previously, brine shrimp sold from each of these areas have a variety of qualities and different nutritional profiles as well (e.g., Webster and Lovell 1990; Webster and Lovell 1991). Regardless of which location the cysts are collected, the bottom line is that thequality of the cysts is usually more important than the location of collection, and hobbyist grade cysts from any location are equally low in their nutritional value without enrichment. In fact, it turns out to be difficult for hobbyists to even get premium cysts. That may well be a significant factor in the variable success of hobbyists in rearing larvae of any of our animals fed baby brine in captivity. Well, I’ve been talking about enrichment throughout this article, but I haven’t really given you any guidelines for how exactly to accomplish that enrichment. Let’s use brine shrimp as an example, and go through how to enrich your food before feeding it to an aquarium. When Artemia nauplii first hatch (Instar I), they do not have a complete gut, and it is not until they develop to Instar II that the baby brine start to feed. The time of development to Instar II depends on a variety of factors (most importantly temperature, but also salinity), but occurs within 6 to 30 hours after hatching. At 28°C (roughly 82°F) it takes about 8 hours for the newly hatched nauplii to begin feeding, and as the temperature drops, that time becomes much longer. As soon as the nauplii hatch, they begin to digest their yolk and become less nutritious with time after hatching, however, once they reach the second instar, they can begin to feed, and you can enhance their nutritional value byfeeding them a highly unsaturated fatty acid (HUFA) supplement that provides high concentrations of essential fatty acids for the health of most marine animals (reviewed by Coutteau and Mourente 1997; Rainuzzo et al. 1997; Sorgeloos et al. 2001). Many people seem to have the idea that you’re trying to soak the nauplii in the stuff to coat them before feeding. While that may be true of frozen foods, it is not particularly effective, and most of the enrichment solution ends up floating freely in your aquarium as dissolved nutrients (just as if you had dumped it into the tank directly) rather than getting into your fish. In this case, what you’re really trying to accomplish is to get the baby brine shrimp to eat the stuff, so that they are basically swimming grocery bags full of those nutrients when you feed them to your reef tank. The problem is that baby brine shrimp are very inefficient feeders, and it takes a long time for them to ingest enough of the HUFA supplement that they become “enriched” (e.g., Evjemo et al. 1997; Han et al. 2000; Han et al. 2001). For newly hatched brine at the second instar, it takes at least 12 hours to get decent enrichment – in fact, its much better to enrich your Artemia nauplii fortwo 12 hour periods (with a water change between them to limit the growth of bacteria in the culture water). To clean the nauplii, simply pour the culture through a “brine shrimp net” (one of the fine, white mesh nets available at any pet shop) and rinse them a couple of times before setting them up in clean water and adding new HUFA. After the two 12-hour feedings of the HUFA supplement, the nutritional value of the nauplii is typically much greater than when they are newly hatched (reviewed by Coutteau and Mourente 1997; Rainuzzo et al. 1997; Sorgeloos et al. 2001). The same is true of adult brine: they are largely devoid of nutritional value when you purchase them at the local petshop, and it is important to enrich them before feeding brine shrimp to your fish. For live adult brine shrimp, it is relatively simple to enrich them with a HUFA supplement (such as Selcon or Zoecon), and that greatly enhances the nutritional value of these animals as a food for your aquarium pets. Brine shrimp become more efficient feeders as they grow, and as a result, larger Artemia can be enriched in shorter times due to that increased efficiency of filter-feeding. In fact, although live Artemia can benefit from periods of enrichment equivalent to those of the nauplii, adults can be significantly enriched in as little as about 1-2 hours of feeding in a HUFA supplement. Be enriching live brine prior to them being introduced to your reef aquarium, you not only provide a popular treat to your animals, but also gain the maximum nutritional benefitfrom feeding these foods to your pets. I include this section primarily as a caution against using these foods for your marine tank. 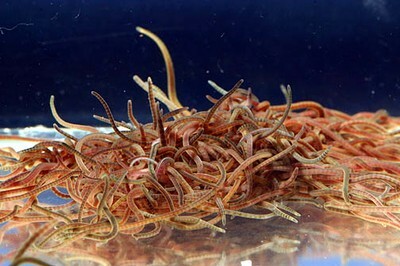 Although many fish appear to like them, these freshwater worms die almost as soon as they are added to salt water, and if not eaten on their way to the bottom, likely begin to rot soon after they sink. In addition, the nutritional profile of these freshwater worms is completely unknown (which is why I didn’t include them in Tables 1 & 2). Although I have no real basis on which to make a decision, I personally doubt that they are particularly nutritious for a marine fish. Therefore, it is my opinion that they should be avoided in favor of some of the other food choices listed in this article. If you remember back to the start of the article, I went on a rant about using freshwater fishes to feed to your saltwater pets. Now, all the sudden you’re reading a section about freshwater crustaceans in an article about feeding saltwater animals – what gives!? Well, the nutritional profile of freshwater crustaceans is actually surprisingly close to that of marine crustaceans (Tables 1 & 2). Unlike the freshwater feeder goldfish comparison with marine fish, in which the fat content can be more than 20 times higher than the natural diet, freshwater crustaceans are actually slightly lower in both fat and Vitamin C content, as compared to marine crustaceans (Tables 1 & 2). There are other differences, too, but in this case, the deficiencies can be easily compensated for by using a commercially available HUFA supplement, because the freshwater crustaceans tends to be roughly equal, or perhaps a bit lower in saturated fat as well as essential fatty acids than the marine prey that make up the natural diet (Table 2). This major difference makes the use of freshwater crustaceans a much better option than freshwater fishes for feeding to your marine aquarium. Table 2: Amount of saturated fat and a number of essential highly unsaturated fatty acids (HUFA) for each of the species groups listed in Table 1. Values for Saturated fats, LA (Omega-6, linoleic acid – 18:2), ALA (Omega-3, alpha- linolenic acid – 18:3), EPA (Omega-3, eicosapentaenoic acid – 20:5), and DHA (Omega-3, docosahexaenoic acid – 22:6) are again measured in grams from a 100g tissue sample as presented in Table 1, above. These fatty acids are among those typically included in HUFA enrichment products to supplement the diet of marine fishes in captivity. Small, non-zero numbers are denoted by < 0.01. This is fortunate for most of us, because in most places small freshwater crustaceans are much easier to come by than their marine cousins. I’ll discuss some of the most common and easily available of these below and explain the potential drawbacks to using them as a food for the inhabitants of your marine tank. These tiny crustaceans belong to the class Brachiopoda, and are commonly found in ponds, streams and small lakes during the summer months. These animals are commonly called “water fleas” and can range from clear to brightly colored, and in size from almost microscopic to about the size of a dried split-pea. They swim with very jerky movements similar to that of copepods (discussed below), which often stimulates the feeding response of even the most picky of plankton feeding fishes. Daphnia and their relatives (I won’t go into the taxonomy of this group here, but consider them all together for the purpose of this article) thrive in freshwater habitats by filtering tiny phytoplankton and organic detritus from the water column, and can reproduce very rapidly under ideal conditions. They can be easily cultured in a small wading pool in the backyard, or collected by net from a local pond or stream. These tiny freshwater relatives of the marine versions seen in virtually any coral reef aquarium often provide a simpler and cheaper alternative food than their marine cousins for feeding to planktivorous marine fishes. They are also usually devoured by coral reef invertebrates such as cleaner shrimps, gorgonians, soft and hard corals, brittle stars and sea cucumbers as well, making them a highly desirable food item. Although marine copepods are not easily available as a commercial food product, freshwater copepods can be harvested from local ponds or lakes, and there are a couple of commercial sources for either frozen or freeze-dried copepods as well. The reason that I am emphasizing these little “bugs” (no they are not really bugs, but that is what most people consider them to be) is that copepods are among the most nutritious of all food items in the ocean. Fortunately, even if the fish do not naturally feed on copepods, many plankton feeders (even picky feeders like pipefishand Anthias ) in the sea readily accept freshwater copepods as a suitable alternative. Given that copepods are a commonly offered and readily accepted by most plankton-feeding marine fishes, the easy availability of freshwater species makes them a simple option for feeding your fish. But remember, that I said there were two important things to consider for any food: 1) the right size/taste, and 2) the nutritional value of the food. So, I’ve said that the size, shape and taste of these tiny crustaceans appear to be acceptable for most plankton-feeding marine fishes, what about the nutritional value? Well, it turns out that copepods are one of the most nutritious plankton foods in the ocean, and a variety of studies have shown that feeding them can significantly decrease the rate of disease and death among juvenile fishes raised in captivity. For example, a recent presentation by Todd Gardner at the International Marine Aquarium Conference (IMAC) in Chicago showed that feeding baby seahorses on a diet of copepods for a few days before switching them onto enriched babybrine shrimp led to dramatic increases in the rate of survival compared to treatments in which the juvenile seahorses were fed only on enriched brine shrimp. Results such as Todd reported (Gardner 2003) are becoming more common, both in the hobby and in aquaculture efforts. In fact, copepods are so highly sought-after that many commercial aquaculture facilities are actively pursuing techniques to raise copepods in sufficient numbers to use as a reliable food supply for juvenile fishes. There are also a number of popular fishes (such as the Mandarin Goby or Scooter Blenny) that actually specialize on these little crustaceans. Unfortunately, there are currently no commercial sources of live copepods for either the aquaculture or aquarium industries, but there are a couple of suppliers of freshwater copepods in frozen or freeze-dried forms. In addition, there is always the tried-and-true method of going out to harvest your own, and whether fresh- or saltwater, adding copepods to thefeeding regimen of your marine aquarium is sure to be a benefit to many of your pets. These freshwater relatives of the shrimp-like amphipods commonly seen in reef aquaria at night are again a common inhabitant of ponds, streams and small lakes during the summer months. Although not quite as simple to culture in your backyard, they are often locally abundant and easily collected with a dip net throughout most of their range. They swim more quickly, and in a much smoother manner than either the water fleas or copepods, and are therefore not quite as useful as the first two groups that I just discussed. Because they are freshwater, they do not survive for long in a marine environment, and because they are relatively quick swimmers that will head directly for the cover of a rock, coral or macroalga when introduced to the tank, there is a reasonable chance that they will find cover and hide until they die from the salt stress of being tossed into a marine tank. Obviously this is not ideal, and can easily contribute to a nutrient problem if too many of these littlegammarids escape being eaten and die/rot in your tank. However, many fishes love these tiny ‘shrimp’ and provided that you add them slowly and allow your fish a chance to catch them, they make an excellent and nutritious treat for your fish. Like the gammarid amphipods that I just discussed, mosquito larvae probably make a great treat food for your fish, but should not be relied on too heavily. This is both because of the fact that the exact nutritional profile of mosquito larvae is unknown, and also because there is an increased chance of overfeeding. Any larvae added to the tank that are not immediately eaten will die due to the osmotic shock of being tossed into saltwater, and then quickly begin to rot in your tank. As with any uneaten food, excess that begins to rot leads to a rapid decrease in water quality and usually leads to health issues as well. The advantage of mosquito larvae is that, unlike gammarid amphipods, they float freely around the aquarium when not actively swimming, and should bob to the surface quickly if they were not immediately eaten. This both gives the fish a “second chance” at eating them before they die, and makes it easy to remove any excess if they are not eaten immediately. As I mentioned earlier in the section about goldfish, I would suggest these freshwater and brackish crustaceans as a better choice for feeding live foods to a marine predator. 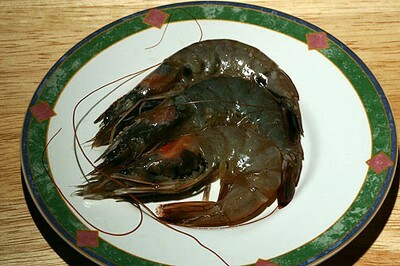 Ghost shrimp are a euryhaline (able to acclimate to water of various salinities ranging from fresh to full-strength saltwater) shrimp that is frequently imported for sale as feeder in many petshops. These tiny clear shrimps are one of my favorite choices for feeding to large marine predatory fishes (such as grouper, snapper and lionfishes) that are picky about eating. Crayfish are not nearly so tolerant of saltwater as are ghost shrimp, but if you live in an area that has an abundance of crayfish and can easily collect your own, this may be a cheaper and easier alternative for you than going to the local petshop and buying ghost shrimp. In addition, the larger size of the crayfish makes it possible to feed larger predators such as adult grouper or octopuses. The primary advantage to using these prey is that the addition of live food usually stimulates even the most fussy of eaters into gorging themselves. As outlined above in the feeder goldfish section, ghost shrimp or small crayfish allow you to feed your animals on a live food other than goldfish while slowly training them onto a healthier alternative. 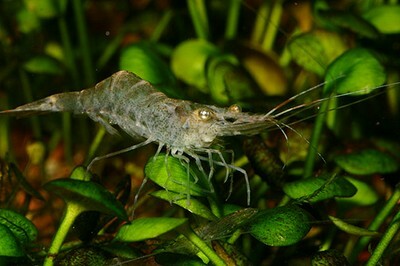 In addition, with both ghost shrimp and crayfish, the nutritional value can be enhanced by feeding an enriched flake or frozen food that includes a reasonable amount of HUFA. 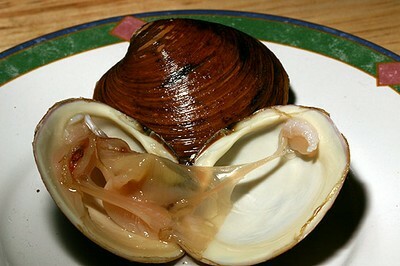 Many predatory marine fish and invertebrates go crazy for live mussels or clams on the half shell. I have spoken to several people who were having little success with getting fertilized eggs from some reef tank fish or invertebrate that they were trying to breed, but after regularly incorporating fresh whole mussels or clams into the diet, their success rate suddenly increased dramatically. Fresh whole seafood (whether squid, shrimp, clams, mussels, snails or whatever else is available) is really THE food on which your animals feed naturally. So, including some fresh or live seafood into the diet of your aquarium is almost always a good idea from time-to-time. However, these same ingredients are usually the staple of most commercially available frozen foods on the market. Look through the ingredients list of your favorite frozen food next time you’re at the pet shop, and you’re sure to see some (if not all) of these listed in the ingredients. There are also a number of home- maderecipes for preparing your own frozen food floating around on the internet if you’re interested, and these are again the primary ingredients for those recipes. Thus, if you’re already providing these through your normal aquarium diet they are probably low on the priority list for diversifying the diet provided to your reef aquarium. In fact, that is probably the best advice that I can offer you: vary the diet of your animals on a regular basis. Numerous studies with marine fishes and invertebrates have shown that a varied diet almost always outperforms (in terms of growth, disease resistance, and/or survivorship) any single prey item as a staple diet. So vary your feedings. Continue to use a high quality frozen food with a wide variety of ingredients as a staple, but don’t be afraid to add some variety to the diet of your tank from time to time. Many of the food items listed in this article are great alternative foods, and it’s a benefit to your fish to add them to your feeding routine if you are not already doing so. It’s not only likely to be better for their health, but the animals will probably appreciate it and feed better as a result. After all, you wouldn’t like to have to eat the same thing every day for the rest of your life would you? Well, last but not least, I come to the section about greens. It’s certainly not because they are least important, but simply because they didn’t seem to fit very well at any point earlier in the article. Many coral reef fishes specialize on algae of various sorts (this is called herbivory), and without sufficient greenery in their diet, they are subject to a variety of malnutrition maladies. This may be because of an excess of animal fats in their diet, or it may be because many trace nutrients and vitamins for these animals are found in highest concentration, or almost exclusively in algae. The truth is that we just don’t have the research available to determine the “perfect” diet for our pets still at this point. Without the carefully controlled experiments necessary to determine exact nutritional requirements, the best we can do is to mimic the variety found in the natural diet to as great a degree as possible. There are a number of great books out there nowthat detail the natural history of coral reef fishes, aquarium corals and other invertebrates, and I encourage anyone who is really interested in the hobby to track down some of these texts. In terms of the size, most fishes and invertebrates that specialize on marine macroalgae (by this we’re talking specifically about the large-bodied algae we see growing on live rock, rather than phytoplankton) are well-adapted to chopping off the appropriately sized bites to eat, so that is not a serious concern. However, the nutritional value of the food certainly is a concern. Many, if not most petshops recommend using leafy lettuce, broccoli, or some other green vegetable to supplement the diet of grazing marine fishes such as tangs, rabbitfishes, and surgeons. The simple fact is that we know nothing about how such foods affect the digestive system of coral reef fishes, and to date no controlled studies have been published that compare growth, health or survival on diets of terrestrial versus marine greens. That does not mean that terrestrial greens are necessarily a poor source of nutrition for these fishes, only that we don’t really know. Traditionally, they were the onlyeasily available source of plant matter to include in the diet of our herbivorous pets, but that is no longer the case. There are now a variety of dried or frozen “sea veggies” available for sale through most local petshops, and these are simply a dried or frozen seaweed that is a natural component of the diet of these fishes. Unlike the terrestrial greens which provide unknown nutritional value, we can be pretty confident that these natural seaweeds are providing some nutritional benefit to our herbivorous pets. However, having said that, drying seaweed also has a variety of effects on the structure and nutritional value as a food. For example, researchers at the Bamfield Marine Station found that growth and survival rates of juvenile urchins fed on air-dried kelp were significantly lower than siblings raised on fresh kelp (De Jong-Westman et al. 1995). The researchers concluded that “air- drying causes chemical changes in the kelp that are ultimately detrimental to urchin health.” However, the researchers never determined exactly what the difference was between dried and fresh kelp that resulted in the decreased growth rates of urchins, and they never tested anything other than urchins (such as herbivorous fishes) to see whether or not these results were generally true for a range of species that specialize on marine algae. 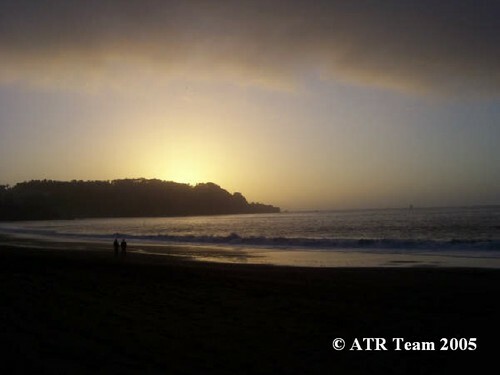 I realize that few people have ready access to fresh kelp, and for most of us, the dried red, green and brown algae available from the petshop is the best that we canoffer. However, it is a concern that dried kelp may not be equally nutritious as fresh kelp (at least so far as we have data now), and so when possible, I usually recommend that people supplement the diet of their herbivores with some fresh (preferably live, but frozen will work) macroalgae as well. Some people have luxurious growth of various types of macroalgae in their refugium or algal scrubbers, and are usually happy to give some away from time-to-time. In addition, there are now a couple of mail-order sources of live macroalgae, so one of these “Tang Heaven” packets may be a good option for an occasional treat to feed your grazing fish. Even if you can’t provide live or fresh macroalgae to your reef tank inhabitants, providing as wide a variety of dried seaweeds to your pets as possible can never hurt! However, there is more to providing your surgeonfish with suitable food than simply dropping it into the tank. Researchers have shown that different species of algae-grazing fishes can have very different dietary preferences and feeding habits in the wild. For example, Acanthurus chirurgus actively seeks out sand and brown and green algae, and A. bahianus selectively ingested sand and green algae, while A. coeruleus avoided ingesting sand and actively sought out leafy red brown and green algae (Tilghman et al. 2001). When dissected, the researchers found that the stomachs of these fish matched their diets: the sand-eating species ( A.chirurgus &_A. bahianus_ ) had very thick and muscular stomachs, while the leafy algae-eating species ( A. coeruleus ) had a very-thin walled stomach (Tilghman et al. 2003). Lastly, to come back to the issue of feeding these fish veggies, species with a long thin-walled intestine are well-suited to absorbing nutrition from crushed algal cells, but are poor at handling cellulose (which is a large component of terrestrial greens such as broccoli and lettuce). Species with a thick, muscular gut, on the other hand, may do a better job of handling high cellulose foods (such as the terrestrial greens) provided that they are given the opportunity to properly grind them up. Let me explain what I mean by properly grinding up food. Herbivorous marine fishes are not known to produce cellulose or any other enzyme to digest the cell wall of plants or algae (Lobel 1981). However, they can digest and absorb the materials contained inside plant cells, if they are able to break open the cells and release the contents. Species with thin-walled stomachs usually rely on very thorough chewing (hence the cow comparison), together with strong acidic secretions of thestomach, to release the contents of cells for subsequent digestion (Lobel 1981). However, species with thick-walled, gizzard-like stomachs often ingest sand particles of a specific size for the purpose of grinding plant and algae fragments in order to break cell walls to allow the fish to absorb the cellular contents of their food (Lobel 1981). These types of fish rely on the action of their stomach, combined with the grinding activity of the fine sands that they swallow, to break apart the algae they ingest and gain nutrition from it. Thus, the first type of fish (thin stomachs) would probably not gain much nutritional benefit from high cellulose foods such as terrestrial greens, while the second type of fish (thick stomachs) may be able to grind these high cellulose foods and gain some nutritional benefit from them. This difference among fishes may explain why some species of tang have traditionally fared well in the aquarium while others with apparently similar needs haveconsistently withered. However, even if your surgeonfish, rabbitfish or tang had a thick stomach, they will not be gaining much nutritional benefit from any plant matter in their diet unless also provided with fine calcareous reef sand to use as a grinder in their muscular gut (Tilghman et al. 2003). This may one of the reasons that some species appear to be showing increased success since the widespread use of sandbeds has come into greater favor. So, what I am basically trying to tell you here is that it not only matters that you provide the right food for your fish, but you provide it on an almost constant basis, and for many species of herbivorous marine fishes, that you also provide them with some fine reef sand so that they can break up the food they ingest and gain some nutritional benefit from that food. I can’t give you any specifics here about the “color” of algae (the color itself is not really important, but different fishes feed on different groups of macroalgae usually identified by their color: red, brown or green algae), or the requirement for sand of your herbivorous fishes, because they vary greatly among species. What I can do is tell you the generalization that young fishes need to feed almost continuously throughout the day, whereas older fishes can survive on more periodic feedings. Also, the fish themselves are excellent at choosing the foods that they require, and so the more varied the diet, the morelikely your fish are to be long-lived and healthy. Regardless of these matters, if you keep herbivorous reef fishes in your aquarium, you should make a serious attempt to provide them with a consistent source of algal food for grazing throughout the day if you want to maintain a healthy animal. Well, now that I’ve managed to get through all those details and have covered my list of the most common and easily obtained live foods for the reef aquarium, I hope that I have given you some good ideas to diversify the diet of your saltwater pets. Although it was very difficult at one time to get anything other than flake food for our pets, there are now a wide variety of alternatives on the market, and by offering a diverse and varied diet to the inhabitants of your reef aquarium, you should increase the health and vigor of your animals. Together with a suitable environment (in terms of the tank conditions and maintenance), a well-rounded and proper diet should ensure many years of enjoyment from your aquarium.